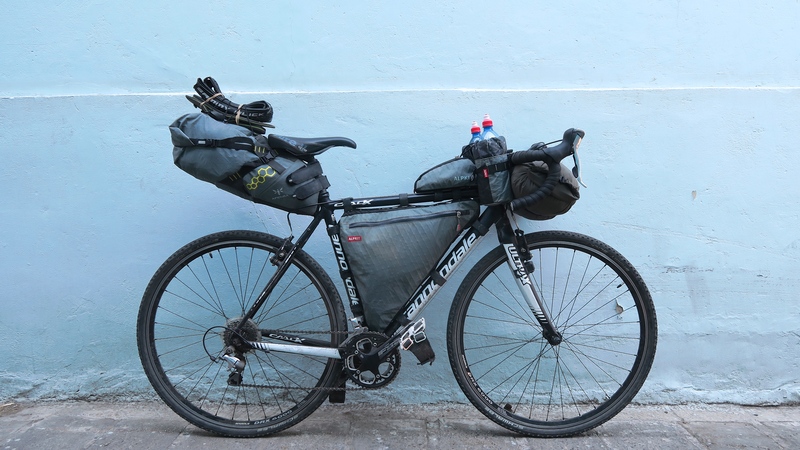 Being my first bike tour, I wasn’t sure how functional my set-up would be, but fortunately it worked well and if I was to start again I’d choose exactly the same bags. I opted for this saddle bag in short because it was the largest I could find. At 17.5l i’ve not come across another saddle bag as big – at least not available in Europe. Despite the large size the bag holds well and when properly attached it doesn’t swing at all – even when cycling out of the saddle. The two straps securing it to the seatpost are really strong, and the other straps on the bag are all very easy to tighten to help get a snug and sturdy set-up. The finish is also very neat and professional. The only issue I’ve had which isn’t a major issue at all, is that inside the bag there is a plastic insert that helps to strengthen the underside. I can feel that mine has snapped towards the base of the insert (near the seatpost). I think this is because of the way I packed the bag, the bottom is quite narrow so it’s difficult to pack it out, and as such the weight has pulled it down and the plastic has snapped. You can see this in the pictures where there is a slight kink underneath. This hasn’t really affected the function of the bag though, it still holds tight and doesn’t really make any difference. It’s not cheap, but I fully recommend this bag, it’s great and amazing how much you can fit in it. I used this bag solely to carry all my clothes in. The 13l bag when fully packed fits perfectly between my handlebars which are 42cm in width. Alpkit also make a harness to use with this called the Kanga, but I didn’t need it as I had plenty of tyre clearance. The bag attaches securely no problem on it’s own. The Airlock Dual opens at both ends. I actually put all my clothes in an Alpkit 13l dry bag first, then put that in the Airlock Dual – this isn’t necessary at all, but I liked it. This actually made the dual end opening a little redundant as the dry bag only opens at one end, but I did still find that when I fully packed the dry bag, it was useful that the dual bag opened at both ends, because you could reach in and pull the stuffed dry bag through from the other side instead of tryng to shove it in. Once attached to the handlebars it’s a little difficult to tighten the straps to get a really snug fit which you really need on rough terrain. I did though get the knack of it in the end, so I didn’t have any issues with the bag flopping around. When the bag isn’t fully packed and doesn’t bulge at ends, the bag spins around a bit within the straps as the straps aren’t attached to the bag itself, they instead just run through two rubber loops (for each strap) that act as a guide. (I assume this is because if the straps were sewn to the bags directly, it would create a weak point where the bags could eventually tear or leak water). 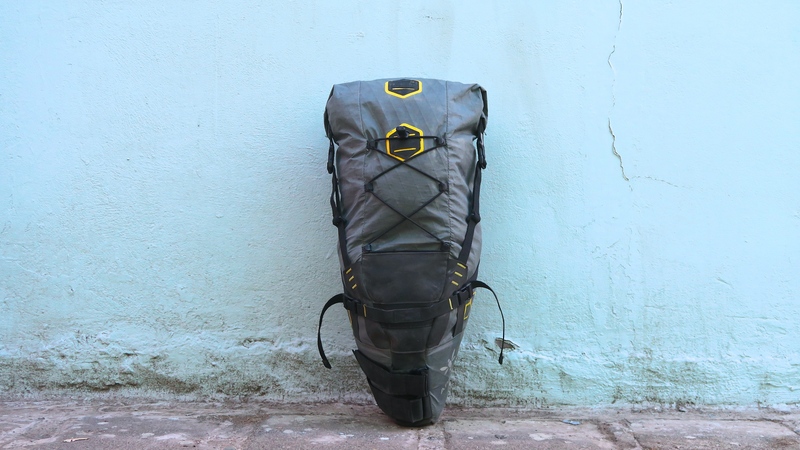 Anyway the issue with this is that when going over rough terrain, the straps gradually pulled my clothes in towards the centre of the bag, and hence the straps would no longer hold snug at the ends and it starts to flop about a bit. In short, the bag functions better when full so you may as well fill it. I think if Alpkit added a third guide loop for each strap it would keep it more in order. Apart from the above though, I had no issues at all with the Airlock Dual and I wouldn’t hesitate to buy again. It’s very strong and I can see this lasting a long long time. It’s also a tasteful design. 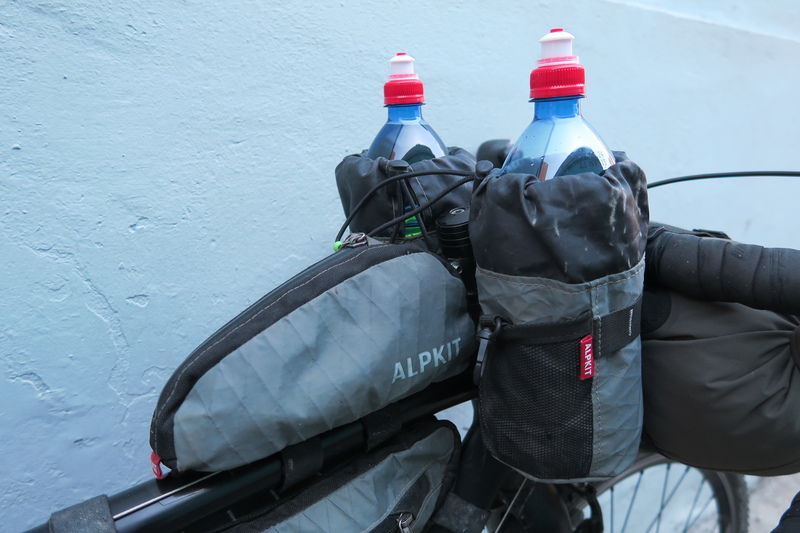 Note Alpkit also make a 20l Airlock but I wouldn’t require a bigger bag nor would it fit between my handlebars – something to keep in mind if you’re riding drops too. Priced at £11, this a bargain. To order a custom made bag for your own bike frame you need to make a cardboard cutout template and send it to Alpkit. Alpkit provide very clear instructions on how to do this, it’s quite easy. Alpkit advise that they aim to get this to you within a maximum of 3 weeks after receiving your template, but they actually got mine made and sent to me in the Netherlands in little over a week. As stated above, prices start at £65. I added a document pocket costing an extra £15, and a horizontal divider costing a further £20 – therefore mine cost me £100. The document pocket turned out to be extremely useful, I used it to store my maps, my notebook and pen, passport if I knew I’d be needing it that day, and any other random bits of useful paper. The pocket helped keep my papers separate from the rest of my things, and kept them nice and straight crumple free. At no extra cost, you can have this bag made to widths of 4, 5, or 6 cm. Alpkit advise you to think about this and not necessarily choose the widest as it may bulge at the bottom and interfere with the bike’s chainring. My bike has a downtube diameter of 6cm, with an extra 1cm of clearance to the chainring. On that basis I opted for the bag to be made to a width of 5cm. I also had the horizontal divider added which gives you two compartments and stops everything gathering at the bottom which will happen if you overpack with small items. When I first packed my bike up, my bag was bulging and running too close for comfort to the chain. I ended up changing my set-up though after realising my tent would fit diagonally into the frame bag and serve in giving the bag a rigid structure. The rest of the bag I then filled with my repair kit (also handy to keep spare spokes in) whatever else I might want handy for that day, and any food – see packing tips for more details. I’m glad I never went for the 6cm, and would probably recommend just going with the 4cm just to be sure. Due to putting my tent in the frame bag, I ended up not using the divider at all (by removing the velcro insert), however the extra zip half way down the bag still came in handy for accessing items further down the bag. I’m also still glad I have the option to use the divider as I know I’ll use it in the future for trips without the tent. The bag itself is extremely well made and I absolutely jam packed mine and the zips held up very well – they’re really strong and have a great seal around them. I also didn’t get any leg rub, the bag is in no way an inconvenience at all and is really handy to access when on the bike. It can be quite time consuming putting the bag on, attaching all the straps, so I therefore used to just leave it on the bike overnight when I could – which was most of the time. The bags are extremely water-resistant but they aren’t waterproof though, so just keep that in mind what’s in the bag if you leave it on the bike overnight in case of heavy rain. Overtime the straps will rub on the frame and will begin to damage for paintwork. I’ve ended up putting tape on the frame under where the velcro straps sit. There’s not a lot Alpkit can do about this. My rear brake cable also runs exposed along my top tube, so I actually put some cable housing along the piece that is usually exposed to make sure the cable doesn’t cut into the straps and also to maintain smooth running brakes. It worked perfectly. If you do ride your bike without the frame bag on, the housing does slap against the bike when the brakes are slack – i.e. all the time. Just a small note regarding sidewinds – I rode through some extremely windy conditions. I probably shouldn’t be riding in such poor conditions anyway, but if you do you need to take a bit of extra care with a frame bag attached, it can act a bit like a sail and can catch the wind which can be a bit unnerving especially on fast downhill sections. Again though, I can’t recommend this bag enough. Although not cheap after the add-ons, it’s been excellent. 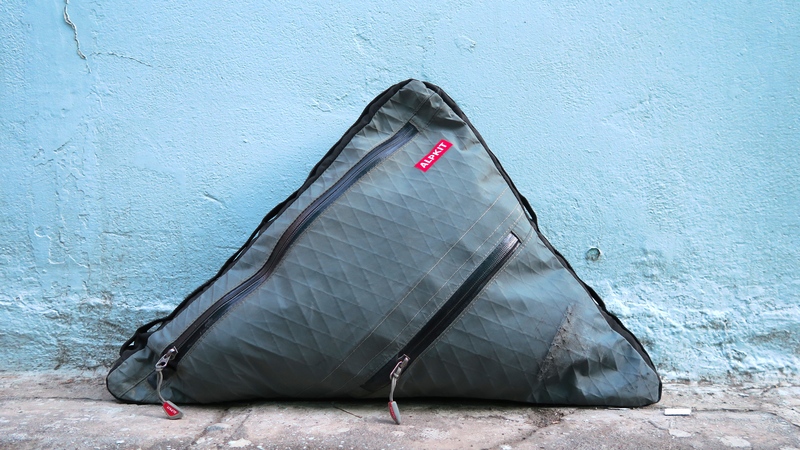 I actually think it would serve as an excellent general purpose / commuting bag too if you don’t mind leaving it on your bike. If I was to go on a just a weekend trip, I may be tempted to take this over the handlebar bag or saddle pack.. Handy bag that sits on your top tube and attached to either your stem or seatpost. Most likely stem as it then sits in a more accessible position. Not much to say about this really, a useful bag. I used it to carry my phone, wallet, mini camera tripod, ipod, snacks, tablets, pen, water purifying drops etc etc. Basically anything small that you may want to access quickly. You could get a compact camera in there if you wanted, but my compact camera is on the larger size of compact so I didn’t. The medium is a decent size, I’m very glad I never ordered a large as it would have sagged over the sides. The sealed zip on it is great, same as those on the frame bag. It can be a bit of a pain getting it on if you also have the frame bag on your bike, but it just takes a bit of fiddling or a bit of ingenuity – one of the straps I cut short and instead of wrapping it all the way round the top tube, I instead velcroed it to one of the frame bag straps. Again, would recommend. It is a bit fiddly trying to get two of these onto one stem, especially when using the Alpkit Fuel Pod too, but once I put these on I never took them off for the entirety of the trip. I basically had two straps for each one. One strap attached around the handlebars, the other around the stem. For the second bag I again just velcroed the strap of that stem cell, on to the strap of the other because it’s difficult to get two straps separately attached to my short 80mm stem. Having the handlebar bag on my bike also supported these as it stopped them sagging down and spinning around / underneath the handlebars. I used these to store my water bottles. I did have an option to attach water bottles to my forks, but I preferred to just keep my water in these. A 1l water bottle easily fits in one of these so I started out with a bottle in each. Later on the trip I lost a water bottle and ended up with a smaller bottle. I stuck with the smaller bottle in the one Stem Cell bag then also used it to fit other snacks in there too, nuts, raisins, chocolate etc. There is also a mesh pocket on the outside of these bags – useful for throwing spare change in there. I had quite a bit of interest in these from other cyclists who said that they wished they’d had these. I recommend them again and will continue to use them. Do you have any sense of how many liters your frame bag ended up being? Also how windy was the trip? I am pondering a bob trailer instead. Heavier yes, but it is out of the wind. No unfortunately I have no idea I’m afraid. 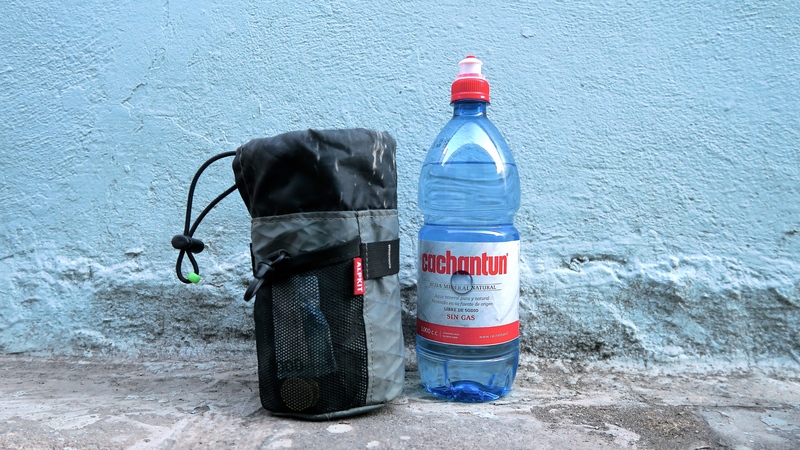 Have a look at the stingray bag on alpkit and maybe contact them directly with any queries. The trip in Chile wasn’t windy at all as it’s pretty sheltered, as you move further south in Argentina though it becomes extremely windy. On my last day you’ll note my rear derailleur broke, and I think that was due to the strength of the wind blowing it into my rear wheel. I shouldn’t have been riding that day though as the wind was so fierce. First of all Nice text! 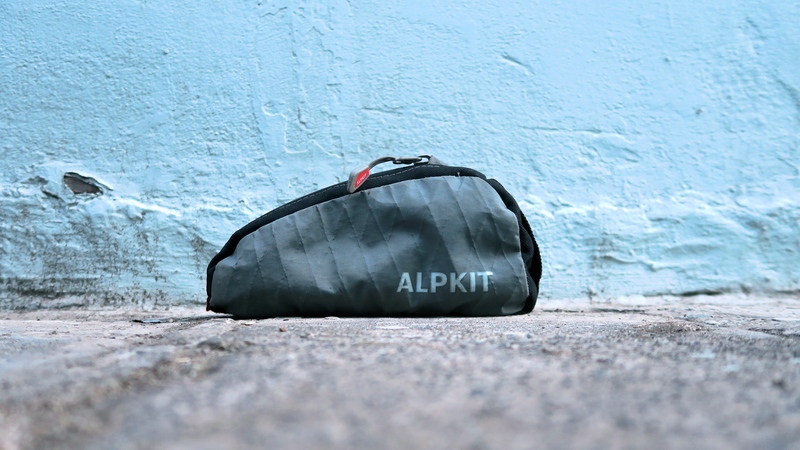 I am also concidering to buy the Alpkit dual dry bag to put on my cx bike with Cantilever brakes, but a am afraid I will have problems with the cable routing (although It is under the bartape) and the routing to the brake. Did you have any problems with this, or is It really as easy as you descriped it? 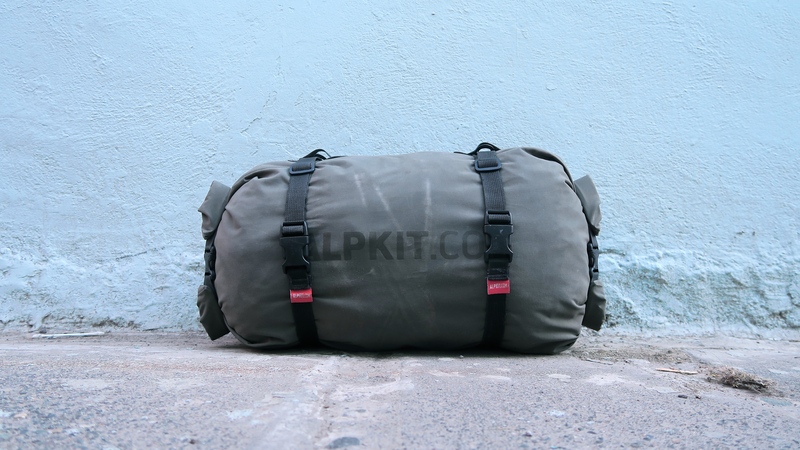 I have tried to strap my Alpkit tapered 13l dry bag and It works just fine. It hangs sollid and doesnt interfere the Cantilever brake. I will order the 13l dual airlock asap! Ah great news, glad it worked out. Cheers Bart. Thanks for the very helpful blog. I was wondering where did you carry food? I currently tour with 2 paniers and one of them is basically food stuffs. Did you just buy food everywhere you stopped for sleeping? Apologies for the delay, I’ve been offline for a bit. I basically didn’t carry much food, I bought food wherever I could, and just carried some emergency supplies and a couple of real basic meals. I had space in the top of my triangle / frame bag. I can’t remember what I ate on that trip so much, maybe always carried a few packs of noodles, and I think porridge oats and some nesquick powder to get a bit of sugar and flavour into it. On my US trip, as an emergency I also carried lots of flat tortilla wraps rolled up, and a pot of peanut butter. Worked a treat. I wasn’t cooking big meals, and just grabbed food where I could though. Hope that helps, and thanks for checking out the blog. Let me know if you have any other questions. Ok so it’s fairly easy to find food on the road around there I assume. Thanks!